Depp starred in a lead role on the Fox television series, 21 Jump Street, which premiered in 1987. He accepted this role to work with actor Frederic Forrest, who inspired him. Depp’s long-time friend Sal Jenco joined the cast as a semi-co-star as the janitor named Blowfish. 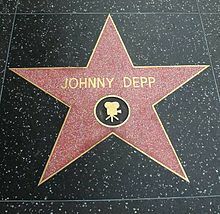 The series’ success turned Depp into a popular teen idol during the late 1980s. Despite this success, Depp felt “forced into the role of product.” He subsequently decided to appear only in films that he felt were right for him. Depp and his co-stars, Peter DeLuise and Holly Robinson, briefly reprised their roles in cameo appearances in the series’ 2012 feature film adaptation, which featured a much more comedic tone than the series. Depp’s first major role was in the 1984 classic horror film A Nightmare on Elm Street, as the boyfriend of heroine Nancy Thompson (played by Heather Langenkamp) and one of Freddy Krueger’s victims. The director of the 1986 American skating drama Thrashin’ then cast Depp for the film’s lead role; however, his decision was later overridden by the film’s producer. In 1986, Depp appeared in a secondary role as a Vietnamese-speaking private in Oliver Stone’s Platoon. Depp’s first release in 1990 was Cry-Baby. Although the film did not achieve high audience numbers upon its initial release, over the years it has gained a cult classic status. Depp’s next release that year saw him undertake the quirky title role of Tim Burton’s film Edward Scissorhands, a critical and commercial success that established Depp as leading Hollywood actor and began his long association with Burton. In 1993, Depp continued to receive critical and commercial acclaim. He appeared in Benny & Joon, which became a sleeper hit. He then starred alongside Leonardo DiCaprio in What’s Eating Gilbert Grape, a film about a dysfunctional family. In his review of the film, Todd McCarthy of Variety said, “Depp manages to command center screen with a greatly affable, appealing characterization.” Depp’s final 1993 release was the surrealist comedy-drama Arizona Dream, which opened to positive reviews. In 1994, Depp played the title role in Tim Burton’s comedy-drama biographical film, Ed Wood, about one of history’s most inept film directors. It received immense critical acclaim, with Janet Maslin of The New York Times writing that Depp had “proved himself as an established, certified great actor” and “captured all the can-do optimism that kept Ed Wood going, thanks to an extremely funny ability to look at the silver lining of any cloud.” Depp was nominated for Golden Globe Award for Best Actor – Motion Picture Musical or Comedy for his performance. In 1995 Depp starred in three films. He played opposite Marlon Brando in the box-office hit Don Juan DeMarco, as a man who believes he is Don Juan, the world’s greatest lover. He next appeared in Dead Man, a Western shot entirely in black-and-white; it did poor business and had mixed critical reviews. 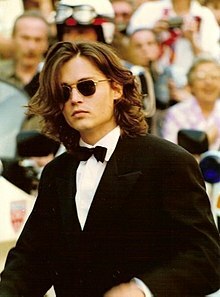 Depp then appeared in the financial and critical failure Nick of Time, playing an accountant who is told to kill a politician to save his kidnapped daughter. In 1997, Depp starred alongside Al Pacino in the crime drama Donnie Brasco, directed by Mike Newell. Depp portrayed Joseph D. Pistone, an undercover FBI Agent who assumes the name ‘Donnie Brasco’ in order to infiltrate the Mob. To research his role, Depp spent time with the real-life Joe Pistone. The film was an immense financial and critical success, and is considered one of Depp’s finest performances. Depp was a fan and longtime friend of writer Hunter S. Thompson. He played a version of Thompson (named Raoul Duke) in 1998’s Fear and Loathing in Las Vegas, based on Thompson’s pseudobiographical novel of the same name. Depp accompanied Thompson as his road manager on one of the author’s last book tours. In 2006, Depp contributed a foreword to Gonzo: Photographs by Hunter S. Thompson, a posthumous biography published by ammobooks.com. In 2008, he narrated the documentary film Gonzo: The Life and Work of Dr. Hunter S. Thompson. Depp paid for most of Thompson’s memorial event in the writer’s hometown of Aspen, Colorado, where, following Thompson’s wishes, fireworks were set off and Thompson’s ashes were shot from a cannon. Depp returned to Thompson’s work with a film adaptation of the novel The Rum Diary, released in 2011. 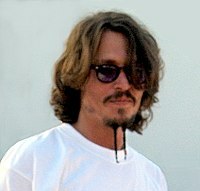 Depp has generally chosen roles which he found interesting, rather than those he thought would succeed at the box office. Critics have often described Depp’s characters as “iconic loners.” Depp has referred to some of his less-successful films as “studio-defined failures” and “box office poison”, and that he thought the studios neither understood the films nor did a good job of marketing them. The 2003 Walt Disney Pictures film Pirates of the Caribbean: The Curse of the Black Pearl was a major success, in which Depp’s performance as the suave but shambling pirate Captain Jack Sparrow was highly praised. Studio bosses were more ambivalent at first, but the character became popular with the movie-going public. According to a survey taken by Fandango, Depp was a major draw for audiences. The film’s director, Gore Verbinski, has said that Depp’s character closely resembles the actor’s personality, but Depp said he modeled the character after The Rolling Stones’ guitarist Keith Richards. Depp was nominated for an Academy Award for Best Actor for the role. In 2004, Depp was again nominated for the Best Actor Academy Award for his performance as Scottish author J. M. Barrie in the film Finding Neverland. He next starred as Willy Wonka in 2005’s Charlie and the Chocolate Factory, a major box-office success that earned him a nomination for the Golden Globe Award for Best Actor in a Musical or Comedy. Depp reprised the role of Jack Sparrow in the Pirates sequels Dead Man’s Chest (2006), At World’s End(2007) and On Stranger Tides (2011), each of which were major successes as well. Depp has said that Sparrow is “definitely a big part of me, and he even voiced the character in the video game Pirates of the Caribbean: The Legend of Jack Sparrow. In director Terry Gilliam’s 2009 film The Imaginarium of Doctor Parnassus, Depp, Jude Law and Colin Farrell each played the character initially portrayed by their friend Heath Ledger, who died before the film was completed. All three actors gave their salaries to Ledger’s daughter, Matilda. Depp played the Mad Hatter in Burton’s 2010 re-imagining of Alice in Wonderland, and the protagonist in the 2011 animated film Rango. In 2007, Depp accepted Warner Bros.’ proposal to make a film version of the gothic soap opera Dark Shadows, which aired on ABC TV from 1966 to 1971. He had been a fan as a child. Depp and Graham King produced the movie with David Kennedy, who ran Dan Curtis Productions inc. until Curtis died in 2006. Depp starred as Tonto in 2013’s The Lone Ranger, opposite Armie Hammer as the title character. Depp had a minor supporting role as the Wolf in Disney’s 2014 film adaptation of the musical Into the Woods. The film began shooting in September 2013 and was released on Christmas Day. Depp will have a cameo appearance in the upcoming film London Fields (2014). He will star in and produce an adaptation of the comic book Rex Mundi. Depp will collaborate with Pirates of the Caribbean: On Stranger Tides director Rob Marshall again to create a remake of The Thin Man. Depp plans to star as Carl Kolchak in the project Night Stalker, and has bought rights to the comic book The Vault. Depp will reprise the role of the Mad Hatter in the sequel to Alice in Wonderland, which is scheduled for a May 2016 release. Depp has signed on to play convicted Boston crime boss Whitey Bulger in director Scott Cooper’s Black Mass. Depp has collaborated with director and close friend Tim Burton in films, beginning with Edward Scissorhands (1990), opposite Winona Ryderand Vincent Price. His next role with Burton was in the 1994 film Ed Wood. Depp later said that “within 10 minutes of hearing about the project, I was committed.” At the time, the actor was depressed about films and filmmaking. This part gave him a “chance to stretch out and have some fun”; he said working with Martin Landau “rejuvenated my love for acting”. Producer Scott Rudin once said “Basically Johnny Depp is playing Tim Burton in all his movies,” although Burton personally disapproved of the comment. Depp, however, agrees with Rudin’s statement. According to Depp, Edward Scissorhands represented Burton’s inability to communicate as a teenager. Ed Wood reflected Burton’s relationship with Vincent Price (very similar to Edward D. Wood, Jr. and Bela Lugosi). Depp did not work with Burton again until 2005 in Charlie and the Chocolate Factory, in which he played Willy Wonka. The film was a box office success and received positive critical reception. Gene Wilder, who played Willy Wonka in the 1971 film, initially criticized this version, Charlie and the Chocolate Factory was released in July, followed by Corpse Bride, for which Depp voiced the character Victor Van Dort, in September. Sweeney Todd: The Demon Barber of Fleet Street (2007) followed, bringing Depp his second major award win, the Golden Globe Award for Best Actor – Motion Picture Musical or Comedy as well as his third nomination for the Academy Award for Best Actor. Burton first gave him an original cast recording of the 1979 stage musical in 2000. Although not a fan of the musical genre, Depp grew to like the tale’s treatment. He cited Peter Lorre in Mad Love (1935) as his main influence for the role, and practiced the songs his character would perform while filming Pirates of the Caribbean: At World’s End. Although he had performed in musical groups, Depp was initially unsure that he would be able to sustain Stephen Sondheim’s lyrics. Depp recorded demos and worked with Bruce Witkin to shape his vocals without a qualified voice coach. In the DVD Reviews section, Entertainment Weekly’s Chris Nashawaty gave the film an A minus, stating, “Depp’s soaring voice makes you wonder what other tricks he’s been hiding … Watching Depp’s barber wield his razors … it’s hard not to be reminded of Edward Scissorhands frantically shaping hedges into animal topiaries 18 years ago … and all of the twisted beauty we would’ve missed out on had [Burton and Depp] never met.” In his introduction to Burton on Burton, a book of interviews with the director, Depp called Burton “… a brother, a friend, … and [a] brave soul”. The next Depp-Burton collaboration was Alice in Wonderland (2010). Depp played the Mad Hatter alongside Helena Bonham Carter, Anne Hathaway and Alan Rickman. In 2012, he starred in the Burton-directed Dark Shadows, a film based on the 1966–1971 gothic soap opera of the same name, alongside fellow Tim Burton regular Helena Bonham Carter, as well as Michelle Pfeiffer and Eva Green.